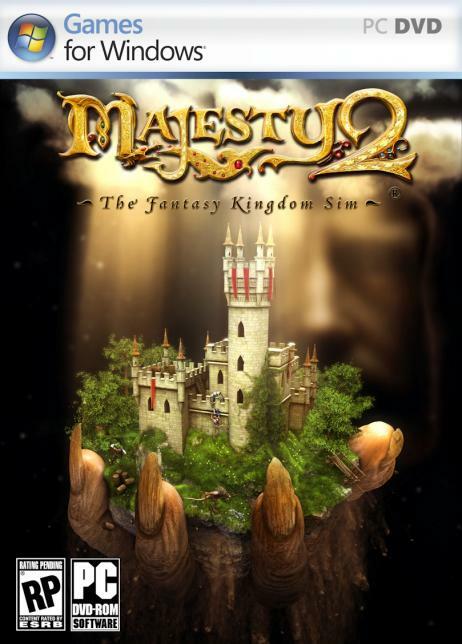 Majesty 2: The Fantasy Kingdom Sim is the sequel to 2000's Majesty: The Fantasy Kingdom Sim. As the name implies, these games are a mix of genres, primarily RTS, RPG, and Sim gaming. Cyberlore, the developer of the original game, has pretty much fallen off the face of the planet, and a new studio 1C:Ino-Co took over, which has some fans understandably worried. With a Q2 2009 release, this preview code was understandably rough, but it's possible to see the direction they're taking the game into. The 3D graphics are pretty good, certainly a lot smoother than the 2D graphics of the original. They're not very highly detailed nor up to par with current graphic standards, but for a 3rd person RTS they're functional enough, as you can fairly easily tell troop types and even individual heroes apart. Not a lot of sounds were implemented, and the preview was at too early a stage to offer solid translations of written text. The spoken comments of the original are not (yet) present, but the intention to replicate the original's humor can easily be spotted. The music is a bit intrusive but not bad. This aspect of Majesty 2 feels closer to an RTS than any other part. You start with a castle and a handful of farms, and can build a wide variety of buildings with supportive functions. Examples are different guilds to create heroes, marketplaces and trading posts to make money and smithies to create items for your heroes to buy. The sim aspect reaches even into town building. In most RTSs you can command your peons to build or repair whichever building you want, in Majesty 2 you only give the command to build and then have to wait until a farmer is not busy with anything else and can pick up the job. Equally, farmers will always attempt to repair damaged buildings (at no gold cost), but if they're busy you can't command anyone to do it. The other NPCs that are a (part of town) are guards and tax collectors. Guards are fairly weak and do not level up or adventure; instead, they just wander about town and attack enemies if they get close. Tax collectors wander from building to building to collect gold earned, which is then brought back to you. Each of these town NPCs are autonomous and do not respond to reward flags. The number of town NPCs you have is determined by the level of your castle, and will auto-replenish for free. Buildings have levels, which they gain when you invest the appropriate amount of money. The building is inactive until a farmer shows up to work on the upgrade. Upgrades are absolutely essential a level 2 guard tower is a lot tougher than a level 1 guard tower, a smith can't produce strong weapons until his building is improved, and leveling up guilds unlocks a number of abilities and spells for your heroes. Majesty 2 focuses the player on small, high-level towns, as buildings become more expensive when you have multiple of the same type. The heroes are any type of NPC that come from one of the guild building. For purposes of this demo, the available heroes were warriors, rogues, rangers, clerics, wizards, dwarfs, elves and a variety of priests. Each hero class has its own set of unique skills: warriors are better against monsters and tend to lure creatures to them, while rangers are better against animals.